Scangrip NIGHT VIEW | Repair Management Nederland B.V.
New from Scangrip the NIGHT VIEW head lamp with Sensor Mode. With the NIGHT VIEW headlamp you can choose between white and red work light. 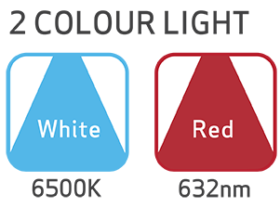 The red light is intended for work in the dark and provides light without overexposing the retinas while at the same time keeping the eyes adjusted for the dark. The red-light functionality is mostly known from the military to read maps on maneuvers at night, but is also needed in civilian professions for work at night, for instance on ships and offshore. On ships it is particularly useful on the bridge at night, because it preserves your night vision so you can work at the control panel. The NIGHT VIEW can also make a difference on oil rigs where employees work long hours in the dark with specialised equipment. Headlamps with red-light mode are also well suited for security guards that work at night in dark surroundings. Supplied with the newest COB LED technology, the NIGHT VIEW provides extremely powerful illumination which spreads the uniform light to the maximum and lightens up your entire field of view. 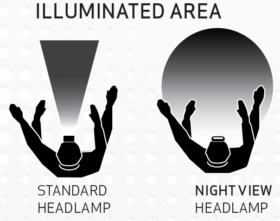 You avoid turning the head to illuminate your actual workspace from a limited headlamp beam. NIGHT VIEW is provided with the very newest rechargeable battery technology with extraordinary long duration, and sets new standards for professional work light. When set on sensor mode NIGHT VIEW is turned on/off only by waving a hand in front of the lamp. Thus, the light can easily be switched on/off, even when wearing thick gloves.